As the date on the letterhead indicates, this brewery has had a long and illustrious history and was one of the oldest breweries in Washington. However, the 1855 date is questionable. The discussion of the brewery will follow a time-line starting with Emil Meyer's City Brewery (1860-1870). But the brewery's beginning is really the tale of two brewers - Emil Meyer and Joseph Hellmuth. In fact the brewery's first owner may have been Hellmuth rather than Meyer. The story continues with Stahl's Brewing Co., City Brewery (1870-1905), followed by his widow's continued operations as the Stahl Brewing & Malting Co. (1905-1910). 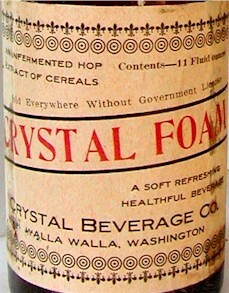 The 1910 merger with Jacob Betz Brewing & Malting resulted in the company doing business as the Walla Walla Brewing Co. (1910-1925) and the Crystal Beverage Co. (1916-1925). Then in the midst of Prohibition, Peter Marinoff purchased the brewery and operated as the Washington Brewing Co. (1925-1933). Upon Repeal the plant became the Northwest Brewing Co. (1933-1936), still under the management of Marinoff. 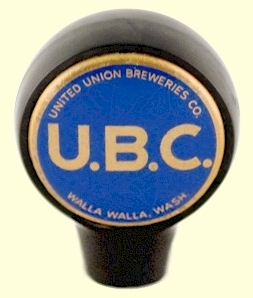 In 1936 the business went into bankruptcy due to a labor dispute, and the following year the Brewery Workers Union bailed it out and named it the United Union Breweries Co. (1937-1944). Finally, in 1943, the Williams brothers of Tacoma purchased the plant, and continued operating it as the United Union until 1944. In that year they purchased, and closed, the failing Pioneer Brewing Co. of Aberdeen. 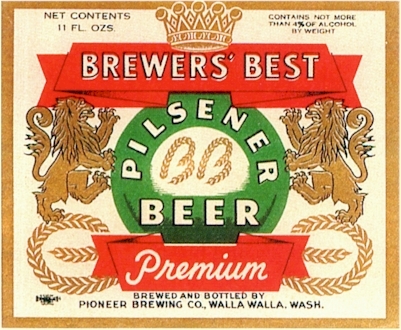 They then transferred the name to the Walla Walla plant, dropping United Union Breweries in favor of the Pioneer Brewing Co. (1944-1951) - a.k.a. 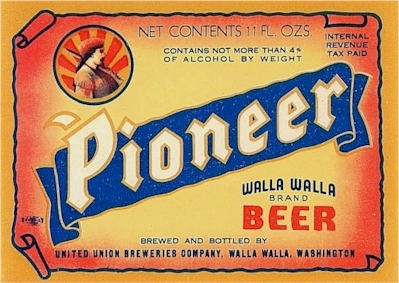 the Pioneer Brewing Co. of Walla Walla. The most difficult part of the story is identifying the beginning of the City Brewery. Few records exist for 1855 and a newspaper wasn't started until 1861. So the exact details of the Brewery's establishment are in question. "This is one of the oldest breweries on the Pacific coast, having been founded by Emil Meier in 1855. In 1870 it was purchased by John H. Stahl and others; subsequently Mr. Stahl became sole proprietor. The brewery was operated for many years in his name, and since his death the business has been continued by his widow. The product of the plant was confined to steam beer until 1888 when the manufacture of lager beer was commenced." Not much is known of Emil Meyer, but some details have been provided by his great-grand-daughter, and these dispute the accepted history. He was born in Braubach, Hesse-Nassau, Germany on the January 1, 1833. He arrived in Walla Walla after serving with the Army, escorting immigrant wagon trains west. Due to the Indian uprisings in the new Oregon & Washington Territories it was necessary for troops to provide protection to the travelers. The Northwest Indian Wars covered the period of 1855-58. During this period, beginning with the Yakima Wars in 1855 and ending with the Palouse Wars in the Autumn of 1858, settlers were banned from the region. 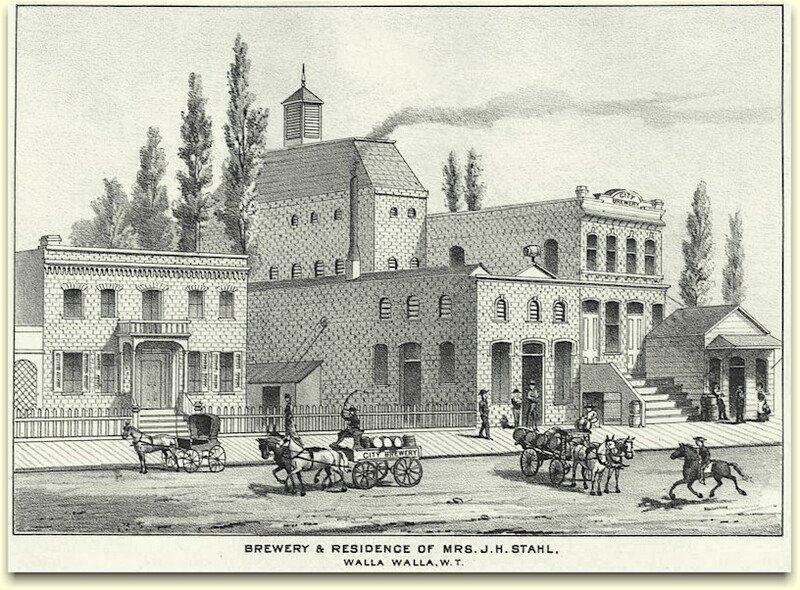 Emil Meyer didn't arrive in Walla Walla until 1859, which contradicts the published account that the brewery was "founded by Emil Meier in 1855." In fact there was no town of Walla Walla until around 1858. Records indicate that Joseph Hellmuth was in Walla Walla, at least, as early as 1858. In July of 1860 the census listed a Joseph Helmeth, engaged in the grocery business, and the adjacent enumeration has Emmel Myer, age 29, a brewer from Hesse, Germany. 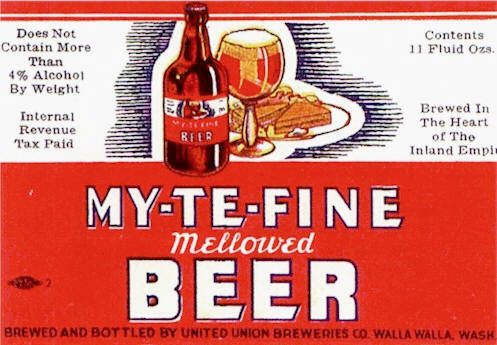 Both Hellmuth and Meyer placed ads in the fledgling Walla Walla Statesman on December 20, 1861, each offering the sale of their beer. They may have been competitors, or working as divisions of the same business. "The business is believed to be the oldest brewery in the Northwest having been founded by John Hellmuth in 1855. The Hellmuth brewery was sold to Emil Meier in 1862 and a deed dated 1864 lists as assets: hops, kettles and a brewery wagon, among other things." Another source reveals that in 1862, Meyer erected a larger building for his brewery in a new location just south of the city limits. And from the above account it appears that the note to Hellmuth was paid off and the deed filed in 1864. And in May of 1864 Hellmuth sells a brewery to Picard & Businger, but by December of that year he has it back - apparently they didn't make good on the contract. 1864 must have been a busy year for Hellmuth. That year he established another brewery in Placerville, Idaho Territory. The Pacific Coast Directory for 1867 lists "Joseph Helmuth, brewery; liquor & billiards merchant." His establishment was a brewery/saloon called the Boise Brewery. Placerville was the staging point for the Boise Basin Gold Rush, and as a result the town's population had grown to more than 3,000 by 1863. So, there was a crying need for the brewing skills of "Lager Beer Joe," as he was affectionately known. From 1864 to 1867, Hellmuth managed to oversee the operation of breweries in both Placerville and Walla Walla, which were over 188 miles apart; and a tri-weekly stage made the commute possible. After the "boom" was over in '67 he shut the Boise Brewery, and continued operating his sole remaining plant in Walla Walla. Records indicate that Joseph Hellmuth was still in the brewery business in 1869. The afore mentioned Pacific Coast Directory also had a listing in Walla Walla for "Meyer & Businger, brewers." It would appear that after the 1864 deal with Hellmuth fell through, Businger partnered with Emil Meyer. In 1867, Meyer sold his City Brewery, but no records have been located that identifies the buyer. So it's probable that Businger purchased Meyer's share of the business. Emil Meyer may have sold out due to declining health. He died only months after the sale, on February 19, 1868 - at the early age of 35. He left a 24 year old widow and three young children. On August 7, 1862 he had married 18 year old, newly arrived Prussian immigrant, Mary Anna Becker. Their three children were, Louisa, b. June 1, 1863; William Henry, b. March 16, 1865; and Josephine, b. April 21, 1867. Joseph Hellmuth outlived Meyer by a mere eight years. On the first leg of a European tour, Joseph and his wife Odelia were traveling on the ill fated steamship Pacific which broke up and sank off Cape Flattery on November 11, 1875. Two Hundred lives were lost. John Henry Stahl was born November 14, 1825 in Holstein, Prussia (Germany). He arrived in San Francisco in 1858. By 1860 he and a German immigrant from Hamburg, Ernest Scholl, have established a grocery business in the gold rush township of Kelsey, El Dorado County, CA. In 1862, he and his bride of two years departed for the Oregon territory. 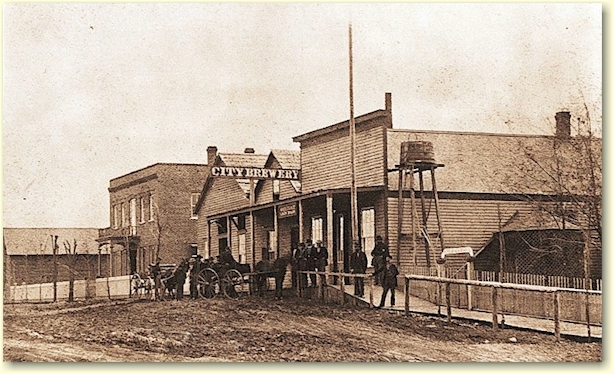 In 1863, the partnership of Stahl & Solaro opened the Canyon City Brewery on Washington St. in Canyon City, Oregon. Stahl soon became sole proprietor and operated his brewery until 28 July 1870. On that date he sold out to F. C. Sels. Two weeks later the brewery was demolished by fire. Stahl and family relocated 170 miles north to Walla Walla, accompanied by Ernest Scholl, who had worked with Stahl at Canyon City - and previously in California. 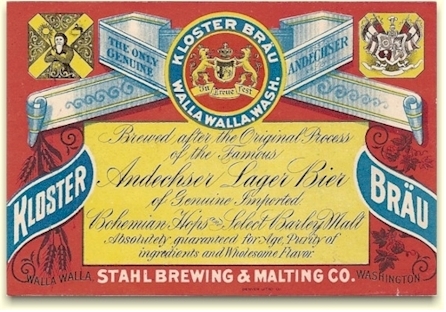 Ernest continued working for Stahl in Walla Walla until 1878, when he and his brother Emil, established the Scholl Bros. Brewery in Pomeroy, W. T. They sold the brewery in 1884 and Ernst returned to Walla Walla. The following was written 5 years after John H. Stahl's death (January 13, 1884) and is more about his widow, Catherine, than him. "This lady is a native of Niederklein, Prussia, and came to San Francisco in 1858. In 1860 she was married to John Stahl, and in 1862 came to Cañon City, Oregon. 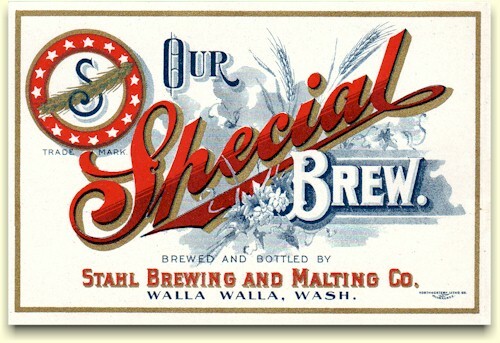 There Mr. Stahl engaged in the brewery business in 1863; but, upon the burning of the city and the loss of their property, they removed to Walla Walla, Washington Territory. Indeed, Cañon City saw rough times in those days, having once burned and twice washed away, and often invaded by the Indians. Still pursuing the same business in Walla Walla, they again met with a loss by fire in the destruction of their dwelling-house in 1871. During his residence there, Mr. Stahl served as city councilman, and in 1880 enlarged his business by building a new brewery, and purchasing six acres of ground for the site of his business and residence. He also owned a block for which he paid eight thousand dollars, and erected upon it a building at the expense of six thousand dollars. In 1883 Mr. Stahl died after a long illness. Mrs. Stahl found that his business was under heavy encumbrances, but, developing large capacity of her own, immediately began an active supervision of the work. She soon extricated them from debt, and within three years was receiving a handsome income. In addition to her city property, she owns a farm stocked with forty head of cattle and twenty-five horses. Mrs. Stahl is another illustration of the Western woman's capacity for independent business. Notwithstanding the loss of her husband and her eldest son, she has lived through her troubles and conducted a large business successfully." From the time the plant was established until 1888 steam beer was brewed exclusively, but after that lager was the beer of choice. The brewery was located at 2nd & Birch Streets. While the bulk of the brewery's output was sold by the keg to local saloons a portion was bottled for export to outlying regions. Prior to 1890 it was required that the beer first be put in kegs, tax stamps applied, and then if it was to be bottled the kegs were transported to the bottling house - which was often an agent/distributor. With death of the brewery's namesake, sons Ernest and Henry (John Henry, Jr.) took a more active role. Unfortunately, in June of 1886, Christine's eldest son, Ernest, died at the early age of 24. Henry was now in charge, not only helping in the brewery, but also partnering with local saloon keeper and liquor agent, Adolph Schwarz, in a bottling business. They took care of the brewery's bottling needs, as well as taking other bottling contracts. One of their labels is shown below. In May of 1894, Adolph Schwarz made became further involved with the Stahls, when he took Henry's sister, Lulu, as his wife. This move would prove to be fortuitous for Schwarz, as Lulu was destined to become one of the wealthiest women in the state. In May, 1897, Adolph's partner and brother-in-law, Henry Stahl, died of Bright's disease (kidney failure), making Adolph sole proprietor of the bottling works. It also left Henry's younger brother, Frank, as the last son to help Catherine with the brewery. On October 13, 1904 the plant was incorporated as the Stahl Brewing and Malting Company. The new corporation was capitalized at $100,000. Waldemar Stockder was their brewmaster and plant superintendent, as well as a stockholder. 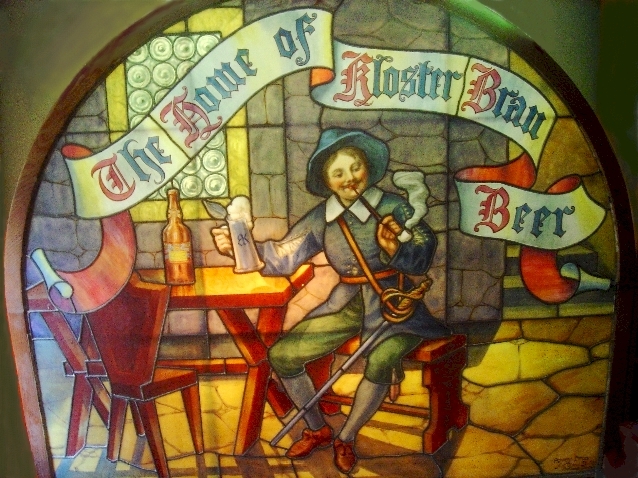 Their flagship beer was Kloster Braü and continued as the primary brand until 1916. The brewery also produced a lager, which they called Our Special Brew - which lasted only until 1910. On April 1, 1910, the Stahl firm was consolidated with the Jacob Betz Brewing Co. The plan was to close the Betz plant, and once a new, larger brewery was constructed, to close the Stahl plant as well. The new plant was erected at 350 So. 2nd St.
Catherine Stahl died on April 16, 1908, leaving her son, Frank Harmon Stahl, the Brewery's vice president, the last family member directly involved in the operation of the company. With Frank's death on Oct. 28, 1909, his sister, Mrs. LuLu Schwarz, inherited the bulk of their mother's estate. The following year, Lulu's husband, Adolph, became a major stockholder, and vice president of the newly formed Walla Walla Brewing Co. 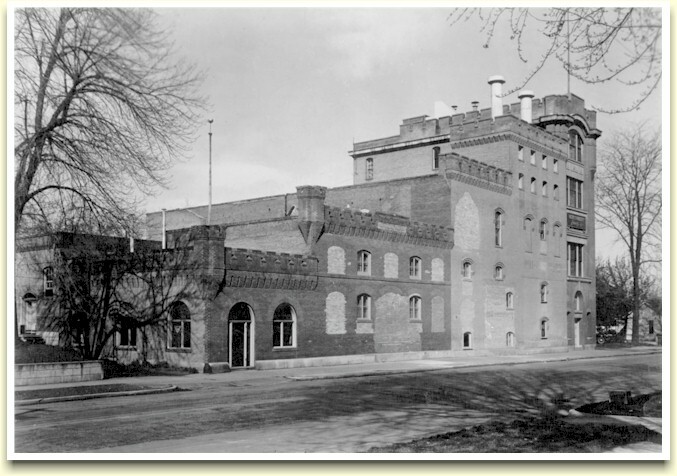 The company's new plant was completed in 1911, and Stockder assumed the position of plant supervisor and brewmaster. He was also a principal stockholder in the company. Unfortunately in January 1, 1916, Prohibition came to Washington four years earlier than national Prohibition. During the 9 years from 1916 to 1925, brewmaster Stockder kept the plant in operation through the production of non-alcoholic beverages. They also began working on the difficult task of formulating a palatable near-beer. 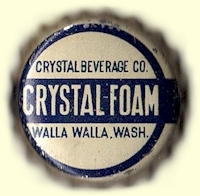 In 1920 they established the Crystal Beverage Co. and introduced their Crystal Foam to Walla Walla. However, as the brewing industry devised better methods in producing near beers that more closely mimicked the real thing, Stockder modified his production. 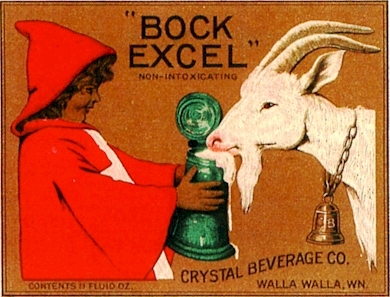 Ex-Cel became his new near-beer, and he also formulated a Bock Excel. In 1925 the plant was sold to Peter Marinoff. Not only did he take the plant, but he retained the services of it's previous supervisor and brewmaster, Waldemar Stockder. The old brewmaster produced Olympic Club Special, and a True Brew brand of near-beer which depicted the Brewery on the label (right). These near-beers were bottled under the name, Empire Products Company. Marinoff closed the plant in July of 1928, but in September of 1932, he commenced remodeling in anticipation of the repeal of national Prohibition. He and Stockder then resumed production of an Olympic Club Brew. d.b.a the Olympic Brewing Co.
At that time the capacity of the plant was 50,000 barrels of beer a year but new steel vats were installed and several new cellars constructed which increased the capacity to 100,000 barrels annually. Anticipating the end of Prohibition, Peter Marinoff established the Northwest Brewing Company, Inc. on 10 February, 1931. His new corporation raised money to refurbish the old Washington Brewing Co. and to remodel an old meat packing facility in Tacoma for for the purposes of brewing. The plants were simply named, the Northwest Brewing Co. - Tacoma, and the Northwest Brewing Co. - Walla Walla. 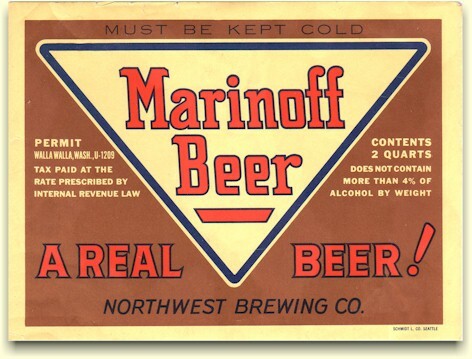 Marinoff also attempted to reopen Portland's old Gambrinus Brewery, but the plant never made it to production. 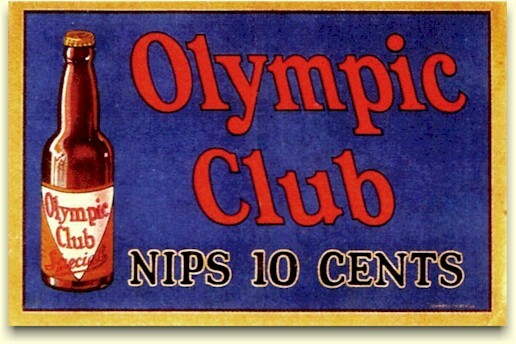 By September of 1932, Olympic Club near-beer was also being produced in the Tacoma plant. However, it was soon to be replaced with real Olympic Club. With Repeal in April '33 Marinoff was immediately up and running with the production of full strength Olympic Club Beer. 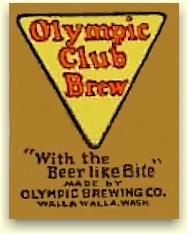 However, the Olympia Brewing Co. of Tumwater was nearing completion of its new plant, and requested that Marinoff be enjoined from using the trade name Olympic Club and slogan "It's the Beer." On Oct. 31, 1933, Olympia got their injunction. Within a week Marinoff appealed, but the appeal was denied. So Olympic Club lasted only six months as a real beer! 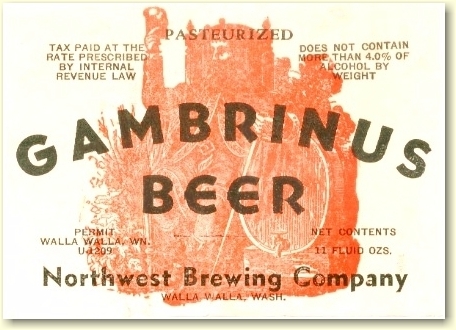 With the purchase of the Gambrinus Brewery in Portland, Marinoff now owned the brand, and with Olympic Club gone, both Gambrinus Beer and Marinoff beer (labels below) became his primary brands. 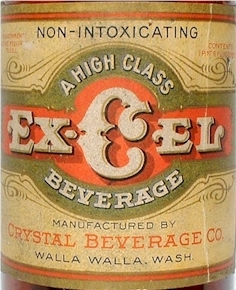 He also produced a Cascade Beer, a Walla Walla Beer, and a Northwest Lager in the Walla Walla plant for the local market. However, his troubles were not over. A labor dispute with the Teamster's Union resulted in boycotts of his beer, and violence against his workers and clients. Trucks were hijacked and saloon windows broken, so he had to resort to armed guards patrolling the plants and riding shot-gun on his trucks. On January 18, 1935 the Northwest Brewing Co. of Walla Walla, Inc. was established. 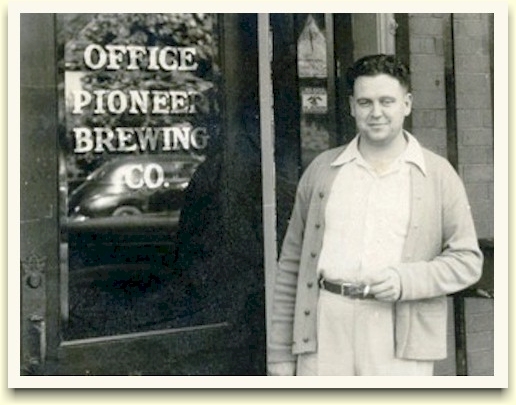 The following month the registered office for the Northwest Brewing Co. (Tacoma) was transferred to the Walla Walla plant were there was less violence. But the Union problems persisted, culminating in a shooting death of a Teamster in Tacoma. Peter Marinoff was convicted of "conspiracy to murder," but the conviction was subsequently overturned. However, the Teamsters were furious at this perceived injustice and vowed to "get" Marinoff. Fearing for his own safety, and that of his family, he fled to California. By mid-1935 the two plants were shut down and forced into bankruptcy. In early July, the Brewery Workers Union announced that they hoped to purchase the company and reopen the two breweries. 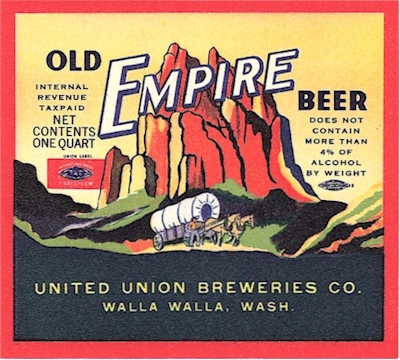 In 1936, the United Brewery Workers Union purchased the Northwest Brewing Company's two plants from the receivers for $27,000, and established the United Union Breweries Co. However, conditions in Tacoma were still too volatile and only the Walla Walla plant resumed operation. The label for their flagship beer is pictured below, and shows not one, but two union "bugs." 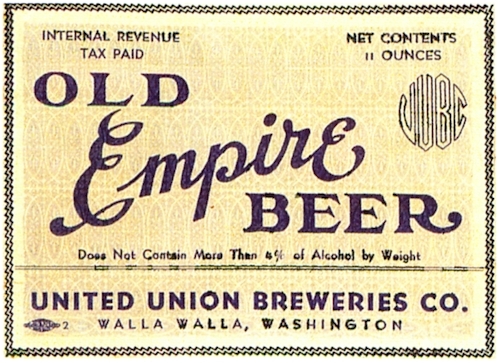 In addition to their Old Empire Beer they also made an Old Empire Bock, a My-Te-Fine Beer and a UBC Beer. In 1943 the plant was purchased by William D. Bryan, on behalf of Williams Brothers, Inc. of Tacoma. Williams Brothers also owned the Mutual Brewing Co. of Ellensburg and the Silver Springs Brewing Co. of Port Orchard. That same year, the Ellensburg plant was closed, and improvements were made in the Walla Walla plant to increase capacity. 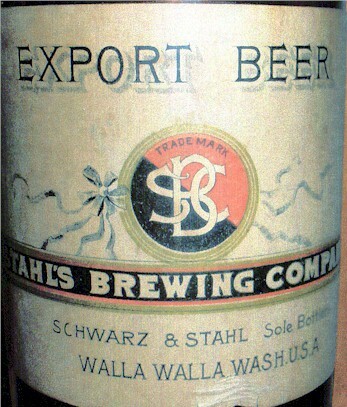 Mutual's Hartz brand of beer was now made in Walla Walla, as well as Silver Springs' DeLuxe Beer. 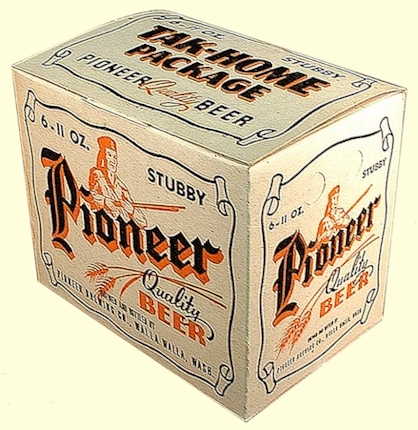 In June of 1944, Williams Brothers purchased the assets, equipment, and brewing formulas of the Pioneer Brewing Co. of Aberdeen. Operations at that plant were discontinued and the Walla Walla plant carried on the activities of the three units - Ellensburg, Aberdeen, and Walla Walla. 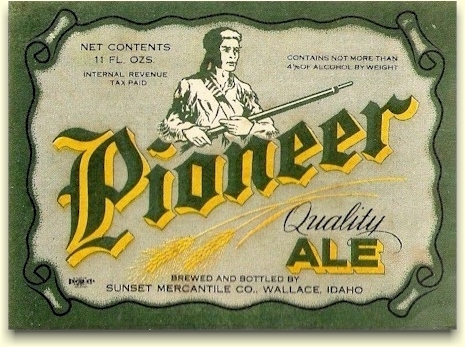 On March 29, 1945, the name of the firm was changed to the Pioneer Brewing Co., and the frontiersman logo was made larger. The label shown (below left) is from the period just prior to the firm's name change. In 1945, more that $150,000 was been spent in a renovation and modernization program in the plant. A bottle house addition with a new bottling line twice as large as the one which had been used was installed. The old Aberdeen plant was kept so the company would have ample bottling capacity - but was never needed. While the manpower shortage was easing with end of WWII, grain shortages continued to plague brewers. In August of 1945, the Williams Brothers purchased the Sunset Mercantile Co. of Wallace, Idaho. 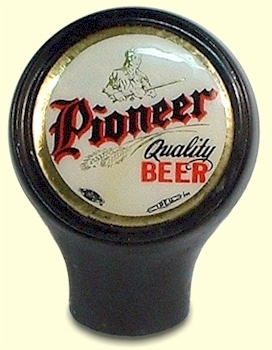 Initially they only produced an Ale under the Pioneer Brand (above). The ale market may not have been strong enough to keep the plant running at a sustainable level. 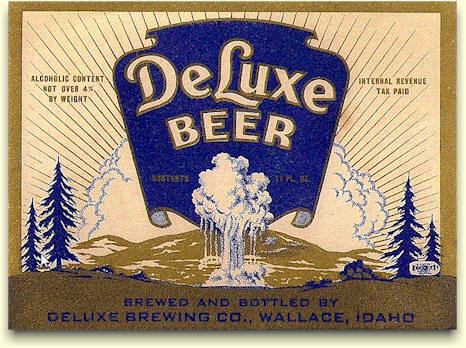 So, in October of '46 they changed the name of the plant to the DeLuxe Brewing Co. and switched production to DeLuxe Beer. However the company was not doing well, and in July of 1947, the plant was placed into receivership. The company continued struggling but in January of 1949, in a re-organization of their various breweries, the Williams Brothers closed the Idaho plant and sold their Walla Walla plant. 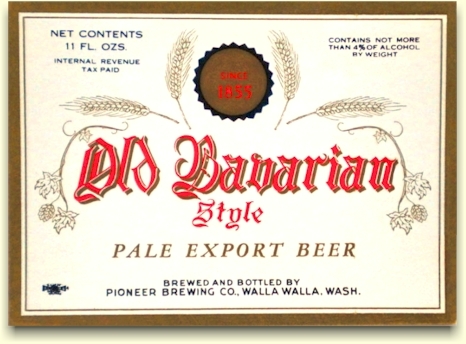 One of the Idaho brands that they acquired with the purchase of Sunset Mercantile was Old Bavarian (below) which they passed to the new owner of the Walla Walla brewery, W. D. Bryan. W. D. Bryan, president, Pioneer Brewing Co.
"Bryan, who is president and general manager, said the concern would start brewing this month under the supervision of C. L. Holtz, brewmaster. 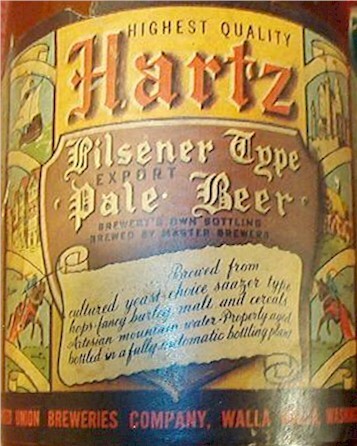 Holtz has been connected with several large eastern breweries and arrived in Walla Walla several weeks ago. Bryan said all necessary licenses to resume operation have been obtained, the equipment put in condition and the personnel hired. Capacity of the brewery is 150,000 barrels a year and much new equipment has been installed the past two years. Bryan also said he had obtained permission to use the name Stahl's Lager Beer on his products. This was used on locally manufactured beer many years ago when the Stahl interests owned the brewery." 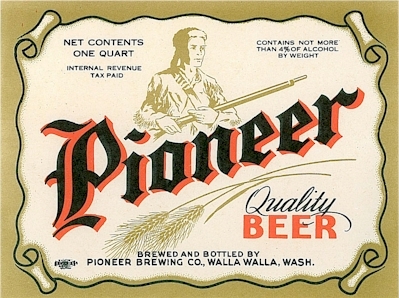 While Bryan had purchased the Pioneer Brewery, the Pioneer brand was not part of the sale. 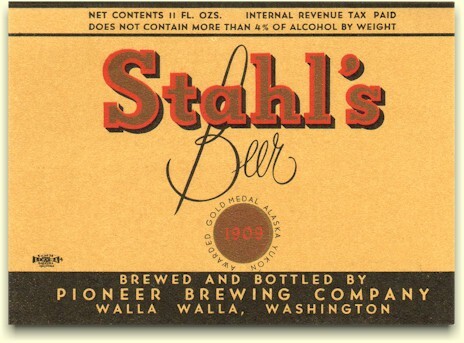 Stahl had some local name recognition, but hadn't been in distribution since before Prohibition. He needed some real brand awareness, and he found it with Brewers' Best. Obtaining a franchise with Brewers' Best Associates, Inc. of NY, meant the brand was advertised nationally, but was produced by scores of small, regional brewers. How this may have worked out for Bryan will never be known. In December of '49 the brewery was heavily damaged by fire, and while repair plans were made, the plant never re-opened. In 1954 the building was sold with the intention to make it into an office building. Those plans also languished and the building was eventually razed. To the Whitman College Archives for the use of early Walla Walla Brewery images. To Jeff Conradt for the Stahl Brg. & Mltg. Co. letterhead, the Stahl Special brew label, as well as the Stahl Special Brew, Marinoff 2 qt., and the 1949 Stahl labels. To the Bryan family for the image of their stained glass window and the photo of W.D. To Mike Magnussen for the Olympic Club foam scraper. To Jeff Henry for the 1941 United Union Breweries letterhead. To Marc Board for the "stubby" six-pack carton. 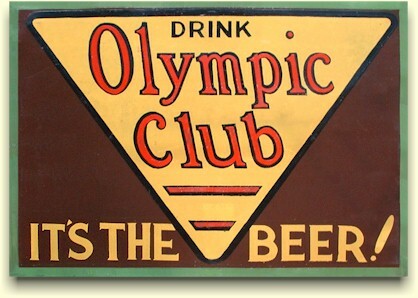 And a special thanks to Patrick & Marilyn McDonald for generously donating the 1933 "Olympic Club" tin beer sign to the Brewery Gems archives. Copyright © 2008 ~ All Rights Reserved.